The New Broilmaster Stainless 42" Grill On Cart With Lights Uses All The Innovations From The Classic Broilmaster Grills And Steps It Up To A New Level Including Cast Stainless Steel Bow Tie Burners, Multi Level Cooking Grates, Heat Zone Dividers, Rear Ir Burner Ideal For Use With Rotisserie Option, As Well As Work Lights And Lit Controls. 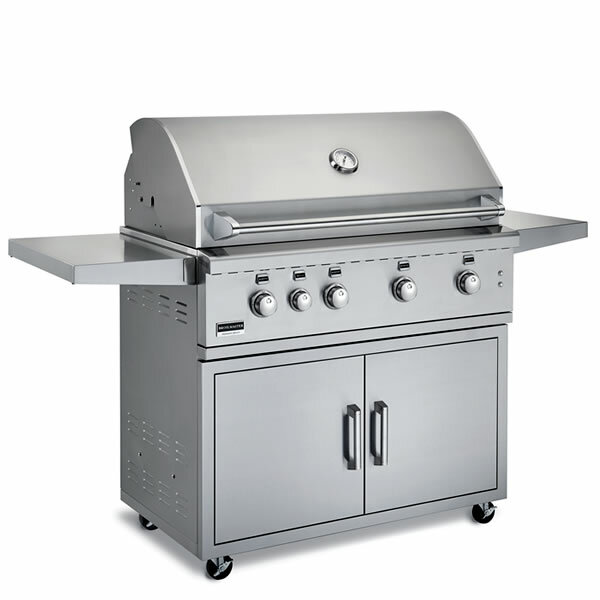 The 42" Broilmaster cart grill is the largest in the line up. We have taken key features from other top performing grill brands and rolled them all into one perfect outdoor grill. Starting with the most important part of any grill we added 4 commercial grade 304 cast stainless steel bow tie style burners. Then the second most important, heavy duty stainless steel rod cooking grids for maximize durability. Then comes our most dependable push-and-turn flame thrower ignition system that delivers a fast start every time. The illumination system compliments its unmistakable style giving an appearance to catch every admiring eye.